"Our results suggest that currently favored greenhouse [gas] solutions could be in conflict with constraints emerging for the middle and late Archean [young Earth]." 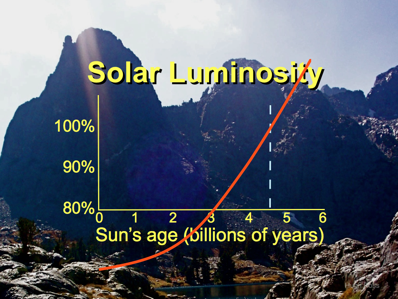 The faint young Sun paradox describes the apparent contradiction between observations of liquidwater early in the Earth's history and the astrophysical expectation that the Sun's output would be only 70% as intense during that epoch as it is during the modern epoch. The issue was raised by astronomers Carl Sagan and George Mullen in 1972. A reduction of 30% of the insolation could mean a reduction from 180 to 125 W/m2 absorbed by the Earth surface, and a reduction of 140 to 100 W/m2 to be radiated from the tropopause, assuming 40 W/m2 directly radiated through the atmospheric window in both cases. This would require a drop in the temperature of the tropopause from - 50 C to - 68 C (from 223 K to 205 K by Stefan-Boltzmann with 223 =(140/5.66)^0.25 x 100). The Earth surface temperature could then remain at + 15 C if the lapse rate increased from the present 6.5 C/km to 8.3 C/km. The maximal lapse rate is 10 C/km and could be attained in an atmosphere without thermodynamics, in an atmosphere at rest without motion of the air, with heat transfer by conduction and radiation but no thermodynamics of convection and evaporation/condensation. An effect of thermodynamics in the present atmosphere can thus be viewed as a reduction of the lapse rate from 10 to 6.5 C/km with the difference increasing with the vigor of the thermodynamics. With a less vigorous atmosphere the lapse rate could thus increase from 6.5 to 8.3 C/km and thus sustain the same surface temperature with only 70% of the input from the Sun of today. In the extreme case of an atmosphere without motion with a lapse rate of 10 C/km, a 50% Sun would thus be enough to sustain comfortable organic life at + 15 C, thus very early in the history of the solar system. Organic life is supposed to be 4 billion years old, apparently ignited by a young 50% Sun. The argument supports the idea of the thermodynamics of the atmosphere as an air conditioner acting to reduce the lapse rate and thus cool the Earth surface as the inside, with the the tropopause as the outside with a temperature set by the input via Stefan-Boltzmann. During the Archean (3.8–2.5 billion years ago), the Sun was up to 25% less luminous than today, yet there is strong evidence that the Earth's ocean surface was not completely frozen. The most obvious solutions to this ‘faint young Sun problem’ demand high concentrations of greenhouse gases such as carbon dioxide. Here we present the first comprehensive 3-dimensional simulations of the Archean climate that include processes as the sea-ice albedo feedback and the higher rotation rate of the Earth. These effects lead to CO2 partial pressures required to prevent the Earth from freezing that are significantly higher than previously thought. For the early Archean, we find a critical CO2 partial pressure of 0.4 bar in contrast to 0.06 bar estimated in previous studies with 1-dimensional radiative-convective models. Our results suggest that currently favored greenhouse solutions could be in conflict with constraints emerging for the middle and late Archean. The slope of the actual lapse rate as opposed to the adiabatic lapse rate set by gravity is integral to the speed of the hydrological cycle. "Entirely consistent with my suggestion that since then the Earth’s tropospheric temperatures have remained largely stable (subject to continental changes) due to the hydrological cycle now being faster than then. As Claes says the adiabatic lapse rate is about 10C. If it was 8.3C back then the hydrological cycle was less vigorous than today just as I suggested in 2010 (and before). Very good Stephen. We think along the same lines, and we are not alone. Given that it is likely that the earth's atmosphere started out just as Venus is today, 90 odd bar of CO2 plus other minor gases and as water condensed (something it can not do on Venus) the CO2 was gradually sequestered into the rock by early life and dissolving into the oceans, and that to understand the faint young sun paradox you need to understand geology and early life more than climate science. There must be 70 bar or more CO2 in the limestone and dolomite rocks found on earth. Where else did it come from? When will these so called highly educated scientists join up the thinking? It occurs to me that the slope of the actual lapse in so far as it diverges from the ideal lapse rate set by gravity in one layer would not need to be compensated for by an equal and opposite distortion in the other direction in another layer if the affected layer expands instead. So if the actual lapse rate in the troposphere is reduced to 6.5C instead of 10C by the presence of water vapour then the thermal effect would be offset by the tropopause height being higher than it otherwise would have been. The reason being that it is density that affects the throughput of energy and an expanded atmosphere is a less dense atmosphere which lets energy flow through faster. So if water vapour reduces the troposphere lapse rate from 10C to 6.5C that slowing down of energy throughput results in a higher, less dense troposphere than would otherwise have been the case and the less dense troposphere then allows energy through faster to offset the thermal effect of the water vapour. So, my earlier contention was correct in principle in that the system has to compensate for divergences from the ideal lapse rate if an atmosphere is to be retained but the appropriate adjustment is made by altering the density of the affected layer through expansion rather than by having an adjustment in another layer. The Ideal Gas Law controls the rate of energy throughput and not radiative physics. The less dense layer would also allow a freer convective circulation because it would be less viscous than a denser atmosphere and would also increase the speed and efficiency of our water cycle. if you increased the lapse rate, wouldn't that mean that the atmospheric humidity went down? Since water vapor is the most important greenhouse gas then that would make the earth cooler. . .